Celebrating few of my most beautiful and fragrant roses, as we remember 'Chaacha Nehru'!! 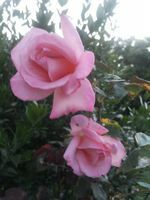 The 'Rose' is a type of flowering shrub, and its name originated from the Latin word 'Rosa', and it belongs to the family of plants called 'Rosaceae'. 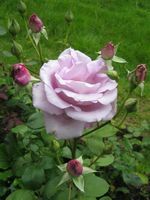 Roses were wild originally in North America, Europe, Africa,and Asia, but now most of the roses seen in the gardens are Cultivars, and many dedicated growers have introduced new and exotic varieties by hybridisation or other methods over the years. The colours range from deep red to yellow, white, bluish-lilac, salmon-pink laced with copper hue, etc, and of course the fragrance is divine! 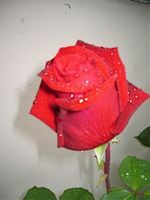 Rose is a symbol of love, a favourite for 'Valentine's day', and it can convey the deepest of sympathy or sorrow too! 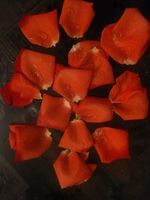 The rose-hip is the fruit of the rose and 'Rose-hip jelly is made from this, which is rather tasty! By any other name would smell as sweet", in 'Romeo and Juliet'! Gertrude Stein in her Famous poem,'Sacred Emily', said the famous quote �Rose is a rose is a rose is a rose�, the first �Rose' is the name of a person, but the quote is often interpreted as a statement of of the 'Law of Identity' in the modern times, to mean 'Things are what they are:A=A'! And of course there is Sean Connery's famous film, �The Name of the Rose'(1986), directed by Jean-Jacques, and many more! 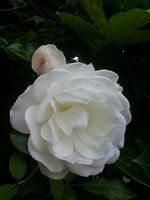 And now, how can the mere mortals like us be blamed for loving this exquisite beauty of a flower with heavenly fragrance and velvety soft petals �the 'Rose'! Enjoy the fragrance and be at one with Mother Nature, as nurturing to the plants and taking care of Earth would guarantee health and happiness for many years to come! Remembering Jawaharlal Nehru on this day, 27 May 2015. The "Light went out in India", 51 years ago on 27 May 1964, the day Jawaharlal Nehru, India's first Prime Minister bid farewell! Today we pay respect to the great man who securely placed India on the side of democracy and freedom! He took office as India's first Prime Minister on 15 August 1947 and delivered his famous inaugural speech 'Tryst with Destiny': "Long years ago we made a tryst with destiny, and now the time comes when we shall redeem our pledge, not wholly or in full measure, but very substantially. At the stroke of the midnight hour, when the world sleeps, India will awake to life and freedom. A moment comes, which comes but rarely in history, when we step out from the old to the new, when an age ends, and when the soul of a nation, long suppressed, finds utterance. It is fitting that at this solemn moment we take the pledge of dedication to the service of India and her people and to the still larger cause of humanity ....". That 'Tryst with Destiny' still gives one a sense of pride as we think of the man who is loved by millions around the world! The Nation wept as India's first Prime Minister's sudden demise was announced 51 years ago on the morning of 27th May --Politicians wept openly and more than 250,000 people including children filed past to pay respect to their 'Chaacha Nehru'. I remember crying hearing the news and everyone who heard the news were in tears too, so much was their love for their beloved Nehru, their first Prime Minister! He was lovingly called 'Chaacha Nehru', who always had a serene smile on his face and a rose in the button hole of his jacket � and the rose became the favourite flower of many in India, and I still have a soft corner for the rose and a special place in my garden too! Fifty one years have passed since his passing and we still think of Jawaharlal Nehru, our first Prime Minister, with abundance of love and respect, which will continue for eternity! May your gentle soul rest in peace with our love and respect!